8:00 a.m. — Registration begins at Spooner Hall. 8:30 a.m. — Doors open to the Commons in Spooner. 9:00-9:30 a.m. — Keynote: Chancellor Douglas Girod. Dr. Girod became KU chancellor in July 2017. Before that, he served as executive vice-chancellor at KU Medical Center. A head-and-neck surgeon, Girod joined the KU Medical Center faculty in 1994 and became chair of the Otolaryngology Department in 2002. 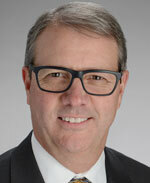 Chancellor Girod earned his bachelor’s degree from the University of California at Davis and his medical degree from the University of California at San Francisco. He served in the Navy Reserve from 1982 until 1997, rising to the rank of lieutenant commander. He has led or participated in a dozen international medical missions in places such as Uganda, Guatemala, Mali, the Philippines and Mexico. Of his numerous awards and honors, he is perhaps most proud of his 2006 Student Voice Award for Teaching on a Surgical Rotation, bestowed by students at the KU School of Medicine. 9:45-11:55 a.m. — “Breaking Cassandra’s Curse: An Ecological World View is Replacing the Industrial Mind (However Slowly),” by Wes Jackson. He earned a bachelor’s degree in biology from Kansas Wesleyan University, Salina; a master’s degree in botany from the University of Kansas; and a doctorate in genetics from North Carolina State University. Noon – 1:25 p.m. — Lunch at the Wheel (half of our group); otherwise, lunch on your own. 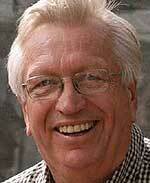 1:30-2:45 p.m. — “The Parthenon in Ancient Athens — Three Mistakes in a Non-Temple,” by Prof. John Younger. 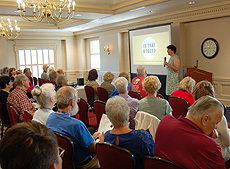 3:05-4:20 p.m. — “Kansas Voices of the Vietnam War,” by Kaye McIntyre, Kansas Public Radio. Kaye McIntyre is the local host of NPR’s “Weekend Edition” and produces and hosts “KPR Presents,” Kansas Public Radio’s public affairs program. She is the project coordinator for KPR’s “Kansas Voices of the Vietnam War,” an oral history project sponsored by the Kansas Humanities Council, as part of the Library of Congress Veterans History Project. She holds a B.A. in political science from Washington University in St. Louis and an M.A. in political science from the University of Iowa. McIntyre has won numerous awards from the Kansas Association of Broadcasting during her 17 years at Kansas Public Radio. 6 p.m. – Pizza and a movie, “Chi-Raq,” presented by KU film prof. Kevin Willmott, one of its two screenwriters. “Chi-Raq” stars Nick Cannon, Teyonah Parris, Wesley Snipes, Jennifer Hudson, John Cusak, Angela Bassett and Samuel L. Jackson. 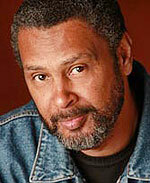 Willmott, also a director, is known for work focusing on black issues, including writing and directing “Ninth Street,” “C.S.A. : The Confederate States of America,” and “Bunker Hill.” He grew up in Junction City, Kan., and received a BA in drama from Marymount College. After graduation, he returned home and worked as a peace and civil rights activist, fighting for the rights of the poor, creating two shelters for the homeless and forcing the integration of several long-standing segregated institutions. He received an MFA in dramatic writing from New York University. He won the Best Director award at the American Indian Film Festival for “The Only Good Indian,” which he produced and directed. 9:00-10:25 a.m. — “Why Opiates are Good,” by Carl Lejuez, KU interim provost and executive vice-chancellor. 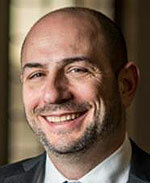 Dr. Lejuez was named to the provost position in mid-April. Before that he had been dean of the College of Liberal Arts and Sciences since 2016. Prior to that, he spent 15 years at the University of Maryland. Lejuez’s own teaching and research activities are focused on understanding and treating alcohol and drug addiction, including cases complicated by other psychological challenges such as anxiety, depression and anger control. His research has been funded by the National Institutes of Health since 2002. 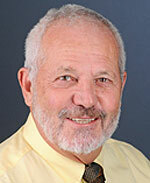 He is the founder of the KU Cofrin Logan Center for Addictions Research and Treatment. “Biosynthesis of Yersinopine: an Opine Metallophore from Yersinia Pestis,” by Cara Davis. Cara is a Wichita junior majoring in chemistry. She began working in a research lab at 17 and hasn’t stopped since. Her research focuses on biochemistry, specifically the structure and function of enzymes. A few months ago, the work from her research project was published in the Journal of Biological Chemistry. She was named a Goldwater Scholar in March and has won K-INBRE (a program for biomedical research) fellowships three years in a row. She hopes to attend a biophysics Ph.D. program and eventually become a biochemistry professor. “Lonely Path to Camaraderie,” by Angie Allen. Using skills and tools learned from Adaptive Leadership, Angie and others in her group were able to bridge the gap between awareness and student veteran support. Research and work by the group led to a better understanding and appreciation of the wants and needs of KU student veterans. The mission of their project is to provide support from one veteran to another for success. Angie is studying Sport Management and double-minoring in Business and Leadership Studies. This past year she was the chair of the Big 12 Conference Student Athlete Advisory Committee, allowing her to represent KU at the conference and national levels. She has also been a member of the KU rowing team. A graduating senior, she has accepted a position at the Big 12 Conference headquarters in Dallas, Tex., working with student-athlete development. “Investigating the Role of syg-2 in the GABAergic Motor Neurons of Caenorhabditis Elegans,” by Chloe Adams. The lab Chloe works in focuses on neural development. Neurons are the fundamental unit of the brain and nervous system. Neurons communicate with each other via electrical and chemical synapses. Her project focuses on genes involved in synapse formation. She is particularly interested in the role of cell adhesion molecules in synapse formation. Chloe recently graduated from KU with a degree in biochemistry and a minor in Spanish. She was involved in a variety of organizations including the KU Honors Program, Tri-Beta Biological Honor Society, BioScholars, and Dennis E. Rieger Scholarship Hall. This fall, Chloe will be attending the University of Washington to pursue a Ph.D. in biochemistry. Noon-1:25 p.m. — Lunch at the Wheel (remaining half of our group); otherwise, lunch on your own. 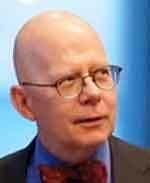 1:30-2:45 p.m. — “Trump’s Rhetoric of National Populism and the Strongman and What It Reveals About American Politics,” by Prof. Robert Rowland. 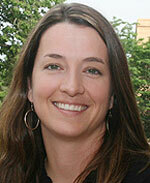 Dr. Rowland is a Department of Communication Studies professor and director of graduate studies. His major teaching and research interests include rhetorical criticism, argumentation, political communication, critical thinking and the public sphere. He is a former director of forensics at KU and Baylor University. As a KU student in 1976, Dr. Rowland and his debate colleague won the National Debate Tournament. 3:00-4:00 p.m. – Tour of the Big Botany exhibit at Spencer Museum of Art (half of our group). 3:10-4:20 p.m. — Tour of the new Earth, Energy and Environment Center, 1414 Naismith Drive (other half of our group). Note: Transportation will not be provided. 6 p.m. — Reception at the Adams Alumni Center sponsored by the Alumni Association. 8:30 a.m. — Alumni Center doors open. 9:00-10:25 a.m. — “Is That a Fact? Truth-Checking News and Information,” by Dr. Lisa McLendon. We’re bombarded with news and information, but how accurate is it? Is what you see online true or false, or misleading? What does “fake news” really mean and how can you spot it? This session will present tips on being skeptical, ways to tell if something might not be real or true, and basic practices for fact-checking and verification. Dr. McLendon is chair of the News & Information track at the KU School of Journalism, where she also teaches grammar, editing and writing. Before coming to KU, she spent seven years as the deputy news desk chief at the Wichita Eagle and five years as news editor at the Denton (Texas) Record-Chronicle. She moved into journalism after earning a doctorate in Slavic languages from the University of Texas. Last year, her book “The Perfect English Grammar Workbook” was published by Callisto Media. 10:45-11:55 a.m. — “The History of Dyche Hall, Its Renovation, and the Grotesques,” by Prof. Leonard “Kris” Krishtalka. This event will include tours of the Natural History Museum as well as commentary by Dr. Kristalka. The commentary will be in the Commons at Spooner Hall. Krishtalka’s interests include paleontology, science policy and administration, biodiversity informatics, and the paleobiology of mammals. He holds a B.S. degree in anthropology and a master’s in vertebrate paleontology from the University of Alberta, Edmonton, Canada, and a Ph.D. in vertebrate paleontology from Texas Tech University. He has directed the Biodiversity Institute since 1995. Before that, he was an assistant director at Carnegie Museum of Natural History and a program director at the National Science Foundation in Washington, DC. 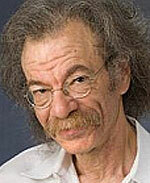 He is the author of innumerable articles in scientific publications and has presented dozens of lectures to his peers. He has done field work in Alaska, Senegal and Pategonia, and is the namesake of Nyctitherium krishtalkai, a fossilized, 50-million-year-old insect-eating mammal about the size of a small hedgehog. Noon-1:25 p.m. – Lunch on your own. 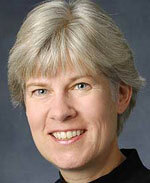 1:30-2:45 p.m. — “Civic Leadership: Tackling Community Challenges,” by Jessica Beeson. 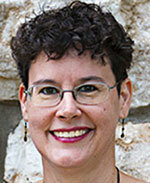 Jessica Beeson founded KU Mini College in 2009. She is the director of alumni and community engagement for the College of Liberal Arts & Sciences. She is responsible for the creation, supervision and execution of multiple projects including educational programs for the community, and alumni and donor engagement opportunities that serve 55 university departments. She is the dean’s liaison to administrative offices and committees on and off campus and manages the dean’s advisory board. During her time at KU, she has created and implemented numerous programs designed to strengthen KU’s relationship with alumni and the community. In addition to her work in the dean’s office, Beeson is a lecturer for the Leadership Studies minor and for the African & African-American Studies Department at the University. She has a BA in religious studies from KU and an MA in Near Eastern studies from the University of Arizona. 3:05-4:20 p.m. — Performance by jazz and flamenco guitarist Alex Frank. Alex Frank is a guitarist, composer and educator based in Lawrence, Kan. Hailing from Topeka, Alex began studying guitar at age 9. Throughout his secondary education, he received numerous scholarships that guided him toward studying jazz and, more recently, flamenco guitar at KU. Now at age 20 he plays in his own jazz groups as well as being a working sideman and solo musician in Topeka, Lawrence, and Kansas City. 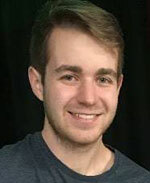 He composes and arranges for big band and small groups, and his pieces have been played and recorded by the award-winning KU Jazz Ensemble I and other top combo groups. Additionally, he is on the faculty at Music House School of Music in Overland Park and Lenexa, teaching private and group lessons and running rock band workshops.